The graphic above was taken from a survey of 500 hiring managers by staffing giant Adecco Group. The results show that companies value the writing skills of workers aged 50 and older. The news release is here. Want a job? At this company, you must pass a grammar test first. The Huffington Post has the story. Coach Candace L. Talmadge discusses effective writing with Erika Taylor Montgomery, host of PUNCH! Media & Marketing Made Easy radio show on KDOW 1220 AM The Wall Street Radio Network. Download and listen here. Forbes marketing blogger Patrick Spenner writes that consumers want simplicity, not engagement on social media, when they are choosing brands. This excellent example of how to mangle the English language made its way onto Facebook in a post by Tom Farrar Talley. It shows painful examples of grammar mistakes. customers to understand what you say about you and your service or product. That extra effort may cost you a sale. Copy-Clinic as a business idea for writers is the focus of a Galley Cat excerpt of an article that appeared originally at MediaBistro.com. Read the brief piece by clicking on these words. 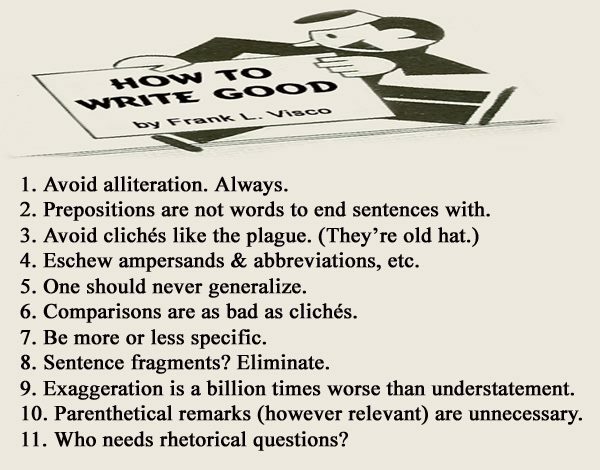 The Wall Street Journal's Cynthia Crossen pens an excellent column on "What makes bad writing?"